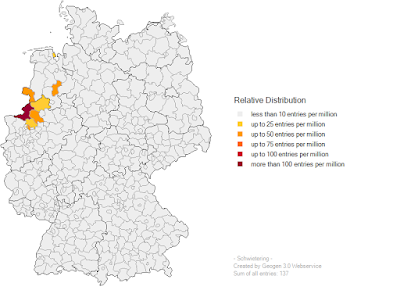 Lost in the Homeland, Part 3: Researching Genealogy in Germany. If you missed Part 1, it's here. For Part 2, go here. So, on to Part 3 of Researching Genealogy in Germany. I have many more resources for you! 10. U.S. Vital Records and Censuses: I've skipped over U.S. records and their potential value to researchers in Germany. Use every resource you can in the U.S. to find that key bit of information: where your ancestor came from in Germany. 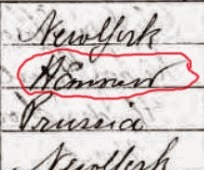 I collapsed a huge brick wall for one of my great-grandfathers when I ordered his death certificate from New Jersey -- no, the certificate did not include the place of his birth, but it included the names of his mother and father. I had been banging my head against that particular brick wall for so long that I knew exactly where to find Conrad and Theresia Ortmann, in the tiny town of Erkeln, in Nordrhein-Westfalen. I had rejected them as potential parents because the dates didn't match up (go back to #9 in Part 2 about dates and ages). I corrected a big mistake in another line when I looked at a New York State Census and found a birthplace for a great-great grandfather -- I couldn't make out what it said, but it definitely did not say "Baden-Wuerttemberg," which is where I thought that branch was from. I asked for help on the German Genealogy Facebook page, and together we figured out that it said "Hannover." An additional bit of information from his N.Y. death certificate convinced me that I'd been on the wrong track -- my great-great grandfather's, Wilhelm Hug's, father was not Benedict Hug of Baden-Wuerttemberg but rather Adolph Hug of Hannover. In correcting this mistake, I had to let go of a line of ancestors that I'd written about and come to love -- you can read the sad story here and here. Genealogists have to live and learn. Which brings us to the next big issue -- how the heck do you read these things?? Help is on the way. 12. Books on German Genealogy: Books on genealogy can be very expensive; it's easy to drop a couple of hundred dollars on them at a conference. I've gotten very choosy and look for the ones that will be most useful, giving me the most bang for my bucks. Two books I've gotten a lot of use out of: The German Research Companion by Riemer, Minert and Anderson, and Deciphering Handwriting in German Documents, by Roger P. Minert. The German Research Companion is a large book chock full of interesting and useful information, from German history to salutations for German letter writing to vocabularies of various subject areas (military, marriage, genealogy) to German-related organizations in the U.S, plus hundreds of other topics. If you can't find it in the GRC, it probably doesn't exist. The Third Edition has just come out. Deciphering Handwriting in German Documents is what you need to understand the death record above -- what makes reading the records challenging is that they may be not only in German but in French or Latin, and that German handwriting has had a number of distinctive writing styles over the years. This book describes the changes in handwriting style over time, gives you examples to study and the vocabulary you need to understand what's being recorded in any of those languages. Soon what at first seemed so daunting is, well, not easy, but definitely easier. And with the help of a chart of Fraktur letters and the good people at the Genealogy Translation page on Facebook when you get stuck, you'll be reading those records in no time. 13. Other books: Other kinds of books may not be able to help you get exact information about your German ancestors, but they can go a long way towards helping you make a small list of facts into a story. Teva J. Scheer's book, Our Daily Bread: German Village Life, 1500-1850, is a readable, fascinating book on how our ancestors lived "back in the day." 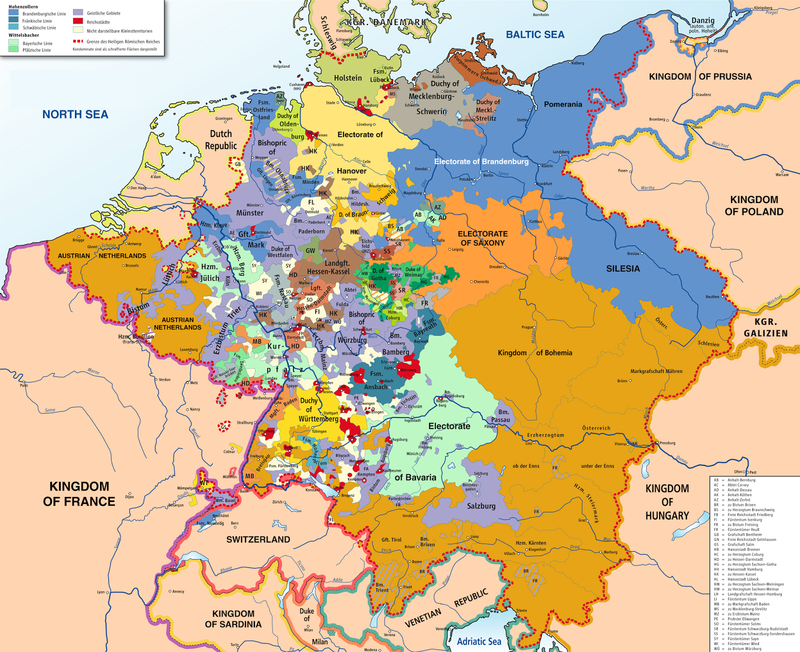 It can help to give you a well-rounded idea of life in Germany centuries ago, and you can extrapolate that to fill in details of how your ancestors likely would have lived. And check around for used or out of print books of various kinds on topics related to your ancestors -- I've gotten a book about the Silesian Weavers' Revolt of 1844 (my great great grandfather was a Master Weaver), a book called Letters on Silesia by John Quincy Adams, and the history of the "lunatic asylum" my great-grandfather died in, written by the psychiatrist who was the director of the hospital for 25 years. This last book is at an academic level of German that makes it very difficult for me to read, but I have gotten enough out of it to know that my great-grandfather died in a progressive institution in which the patients were treated with respect, and I found this comforting to know. So much for Part 3 -- on to Part 4! What a wonderful list. To add to the books, I would include "Discovering Your Germanic Ancestors" by S. Chris Anderson and Ernest Thode. I especially like the lists of genealogical words in various scripts. Also the "German English Genealogical Dictionary" by Ernest Thode, which includes a more extensive lists of words. " In Search of your German Roots" by Angus Baxter - good thorough book on German research. Also although it is out of print, it is available at many libraries "If I Can, You Can Decipher Germanic Records by Edna M Bentz sounds like it is similar to the Minert book.